In the fall, when the leaves turn colors the squirrels are not only collecting supplies for the winter, but are actually also getting ready for their annual party. Follow the preparations and see these industrious squirrels busily decorating and cooking for their special event. 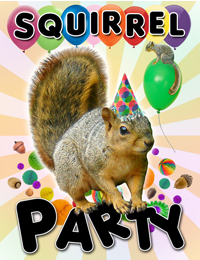 Then experience the fun, when the party gets going and the squirrels get rambunctious. You will be surprised how wild their party gets. The other animals in the forest will talk about it all winter long.